When it comes to professional play, only the best will do — and that goes for any sport or activity played at a serious level. Professional athletes and sports players simply require the highest quality gear on the market, period. 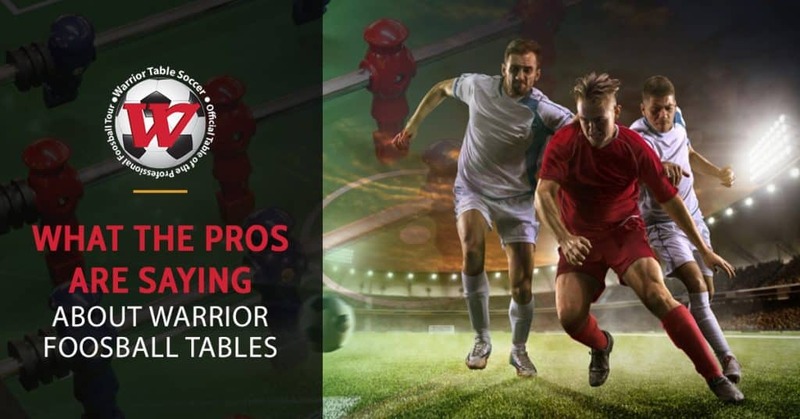 Warrior Table Soccer is beyond proud to provide our tournament-tested and pro-approved foosball tables to everyday players around the world, all for a great price that beats out the best value that other competitors offer. What Makes A Great Foosball Table? The Pros Weigh In. What is it that makes Warrior Table Soccer foosball tables so stellar? Is it the materials that we use, or the engineering behind the table design? Is it the fact that we’re diehard foosball enthusiasts ourselves? The answer is that there are many factors that come together to make the best table for pros and casual players alike. However, we’d like to weigh in on what some of foosball’s most well-known professionals have to say about using Warrior Table Soccer foosball tables. Thank you for your kind words about the quality and versatility of our foosball tables, Tony! That’s especially humbling to hear from such an accomplished foosball champion with more titles than we can even count. We’ll keep working hard to innovate our tables and provide professional players with the best possible playing experience. We appreciate your feedback about our signature rod guard safety system, Liz. People tend to frequently crowd around and walk by foosball tables, and our goal is to prevent any unwanted injuries or poking and prodding from occurring. Safety is our first priority! You really nailed this one on the head, Tony — it’s just as important to make pro-quality foosball tables as it is to make tables designed to foster improvement in your everyday, average player. We’ll keep consistency and control at the forefront of our future table improvements and redesigns. Play On A Warrior Table Soccer Foosball Table For A Pro Experience! You don’t have to be a pro to enjoy your time playing on our professional foosball tables for sale, but you can certainly train your way there with one! Learn more about our signature table soccer table today.